Wroclaw in Poland, is a city of over 600,000 inhabitants in southwestern Poland, towards the borders with the Czech Republic and Germany, just to give a first indication. Crossing the river Oder, the city has always had a troubled history, with lots of invasions of the Tatar, Swedes and Saxons, until after World War II, when the German city since the middle ages, with the whole region of Silesia, was assigned to the Poland as compensation for war. 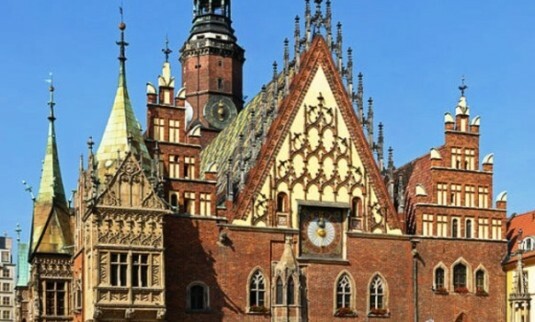 As the whole of Poland, Wroclaw also is enjoying the economic revival that crosses the country, also because of the low cost of living, and low-cost airlines, which have made it an interest tourist destination in the center of Europe. Tourism and tourists who find themselves in the Market Square, Wroclaw, the largest city square, in the center of which were built the Fondaco of fabric and the Town Hall, the latter generally considered one of the greatest examples of Gothic construction in Europe. The building, born in 1242 as a covered market, with the flourish of the city over the years was increasingly enlarged and embellished, until they decided to make the administrative center of Wroclaw. And so in 1333 built the hall of the city council between 1343 and 1357 were added several rooms inside, and between 1470 and 1510 was built the beautiful southern facade. In addition to the facade, and its astronomical clock, which at noon also offers the “little show” of mechanical figures, one should not miss the opportunity to visit the rooms inside, and especially the Grand Council, with its beautiful Gothic vaulted stars from which hang two thousand keystones carved with anthropomorphic subjects. Beautiful at night, the entrance to the town hall, free, permitted from Wednesday to Saturday, from 10 to 17, and Sunday from 10 to 18.